You may be surprised when, after the product finishes processing all the mailboxes and deletes a lot of duplicates, you still see the duplicates in the folders! “What’s wrong?? ?” – asked you. You still see many duplicates but the program does not, and does not want to delete any of them. Do not blame the product. It really is working properly. “But why are the duplicates still in my folder?”— you ask. And the answer is that these messages are not exact duplicates, i.e. the messages are identical in almost every way but really have differences in one or a few fields. This may happen because the messages have different message headers (the headers include technical info regarding message delivering) or anti-virus software text added to the message body, etc. Sometimes you can easily detect where the message have differences (in which message fields) and adjust the product settings to ignore the fields which have differences when comparing message and the messages will be recognized as duplicates because all the other fields are identical. But sometimes all the fields which you see in Outlook show you identical information and you cannot detect which fields should be ignored. We have prepared a solution for such cases. 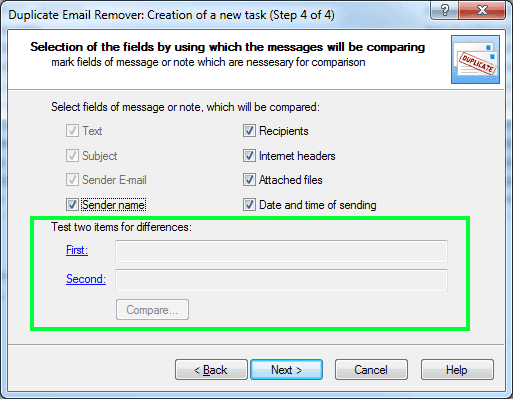 Duplicate Email Remover v.3 allows you compare two messages and detect which fields have the differences. The result of the comparison is a list of message fields with details about the result. 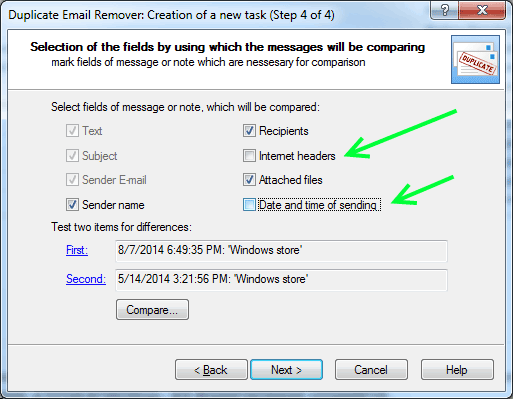 How to use the “Compare messages” feature. 3. Select the first and second messages which you would like to compare. 4. Click the “Compare” button. It is necessary to remove the tick from the checkboxes where differences were found. This will tell the product that these fields should be ignored when the product compares messages to detect duplicates. 7. As soon as the set of fields is adjusted, you can go to the next wizard step to process the mailbox with the new settings. The duplicates which were ignored previously are now recognized and deleted. You are welcome to try this great feature for Outlook duplicates removal – just download a new version of the product at the of Duplicate Email Remover homepage.